PHOTO: Allen Ramsey, DWCPhoto.com. 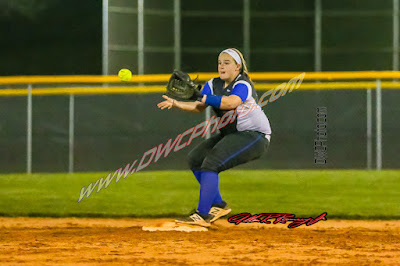 Highlands eighth grader Addie Mack makes a diving stop in the 9th Region quarterfinals against Boone County on Monday. Mack had two hits and a run batted in to help the Bluebirds to a 2-1 win. Facing arguably the best pitcher in the 9th Region in senior Olivia Jackson, the Highlands Bluebirds softball players knew they had to match the Boone County Lady Rebels (15-12 overall) stride-for-stride defensively because runs could be at a premium. Highlands (19-10) took a 1-0 lead into the top of the seventh inning, lost it, but found a way to scratch one across in the bottom of the 10th to pull off a 2-1 victory in the 9th Region quarterfinals at Veterans Memorial Park in Newport on Monday. PHOTO: Allen Ramsey, DWCPhoto.com. 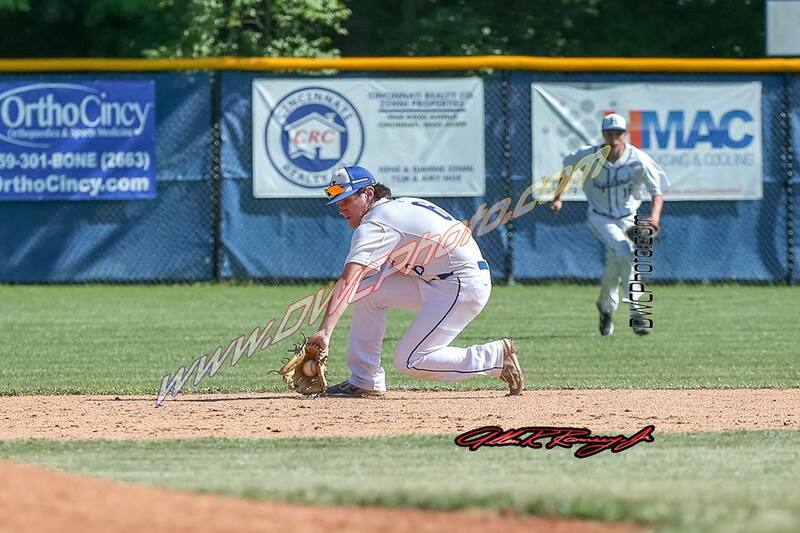 Highlands sophomore Ethan Kavanagh snags a ground ball during the district tournament against Newport. 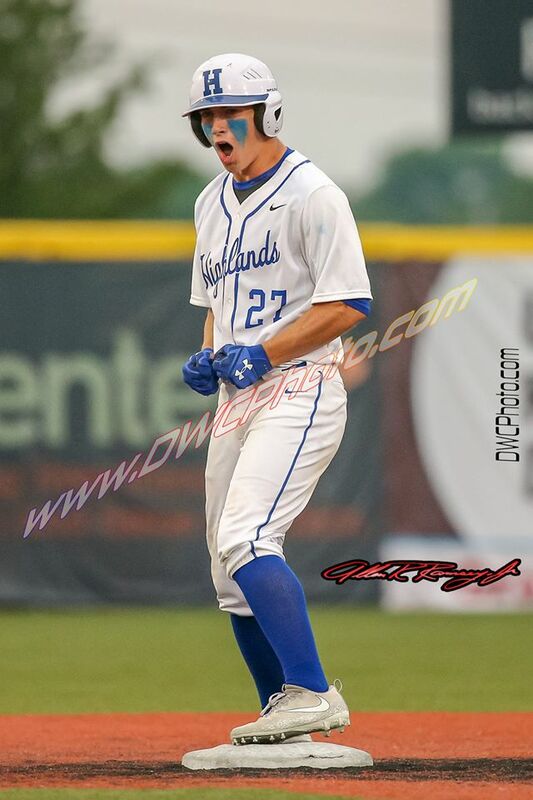 Highlands takes on Dixie Heights at University of Cincinnati Medical Center Ballpark on Monday at 7 p.m. in the 9th Region Quarterfinals. Teams always know they will face one of three teams going into the 9th Region draws. But based on records, match-ups among other teams, teams hope to receive the best possibility of advancing past the region quarterfinals. On Saturday, the Highlands baseball team received a good draw and the softball team did not receive the best draw, but it may be a good thing. Both teams drew the latest start time Memorial Day. PHOTO: Allen Ramsey, DWCPhoto.com. 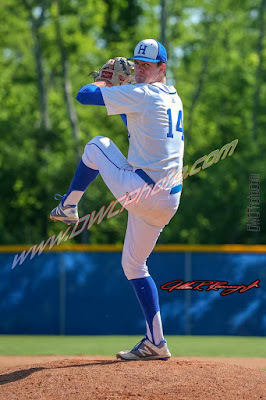 Highlands junior Grady Cramer delivers to to the plate in the win over Newport on Wednesday at Highland Park in the 36th District semifinals. Nothing shows people how serious a top-seeded, heavy favorite is than a convincing shut-out. 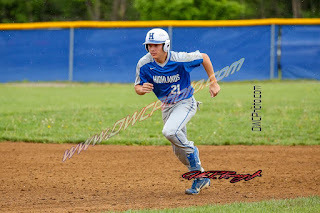 Both the Highlands Bluebirds baseball (22-13 overall) and softball (17-10) more than continued to show why they are the teams to beat in their respective 36th District semifinal games Wednesday. The baseball team took care of the Newport Wildcats, 18-0 at Highland Park and the softball team finished off the Bellevue Tigers, 15-0 in three innings after rain Tuesday forced the postponement for day. Instagram Photo. 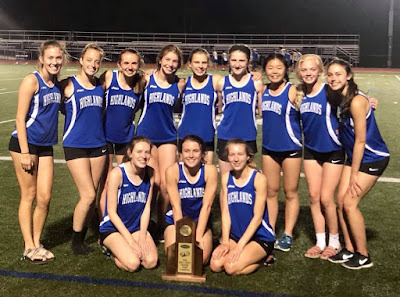 The Highlands girls track and field team placed fourth in the Class 2A state meet over the weekend at the University of Kentucky. The Class 2A Track and Field State Meet took place at the University of Kentucky Outdoor Track Facility on Friday and Saturday after excessive rains postponed the meet for a day. The Highlands Bluebirds girls placed fourth with 53 points and the Highlands boys finished 12th with 18 points. 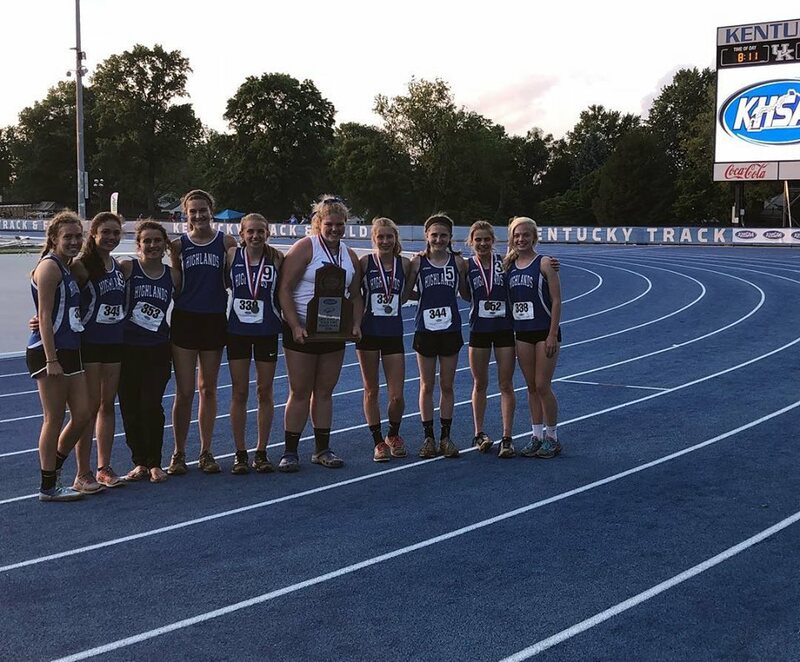 Boyle County won both the boys and girls titles with 110 and 84 points respectively. Twitter Photo. Highlands senior Brooke Hodory makes a move in the state singles tournament Thursday. Hodory won her first match before losing in the second round. 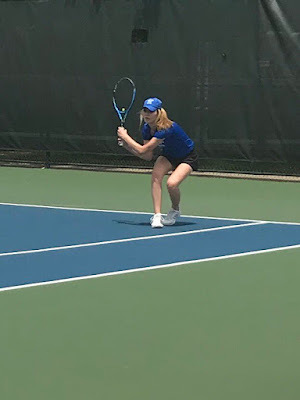 The Highlands tennis teams sent one representative down to the state tournament at the University of Kentucky in each group Thursday. PHOTO: Allen Ramsey, DWCPhoto.com. Highlands senior Maleah Abner takes a swing in a recent game. 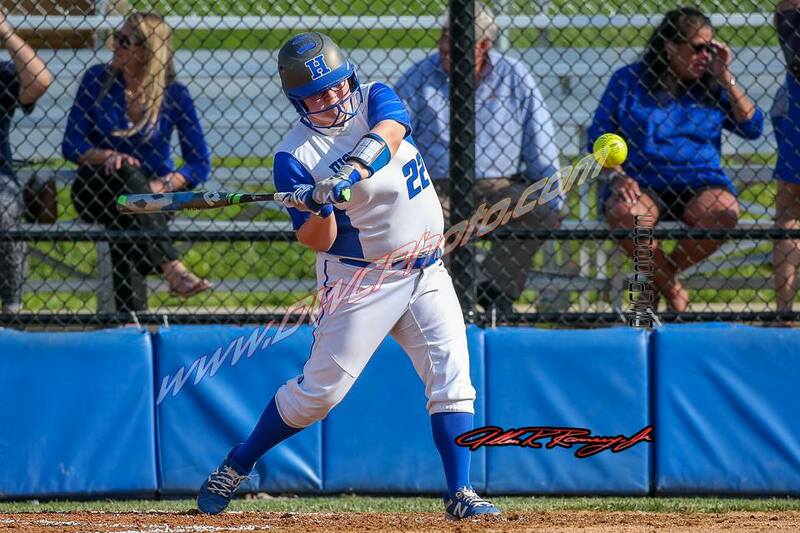 The Highlands Bluebirds softball team finished up the regular season on a positive note with four straight wins. Highlands (16-10 overall) took care of the Dayton Lady Devils, 12-2 in five innings earning a convincing top seed in the 36th District at 4-0 in seed play. 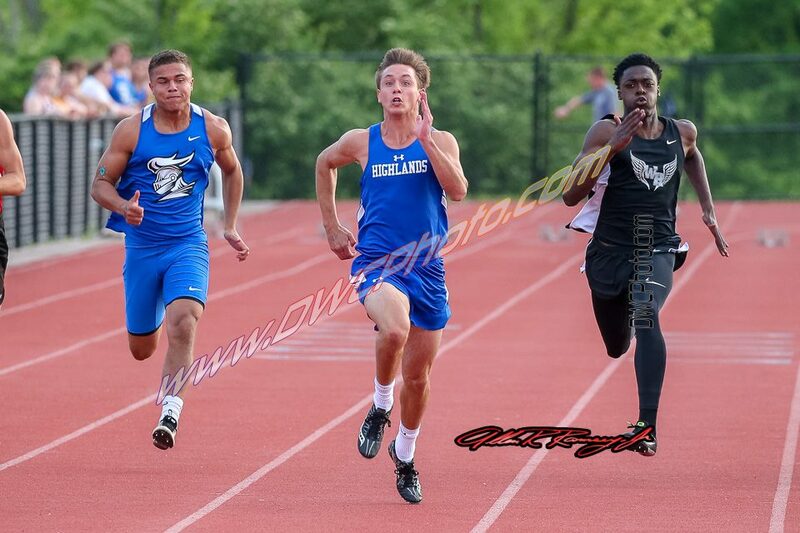 Highlands outscored the four district opponents, 49-5. The Bluebirds also finished 11-1 in 9th Region action. PHOTO: Allen Ramsey, DWCPhoto.com. The Highlands seniors and their families pose before the game against Simon Kenton on Tuesday. The Highlands Bluebirds softball team faced the arch-rivals in a battle of teams that have combined to win the last five 9th Region titles. But the Bluebirds (15-10 overall) claimed this one by a 9-6 score over the host Notre Dame Pandas (13-13). Highlands pulled away with five runs in the fourth inning. 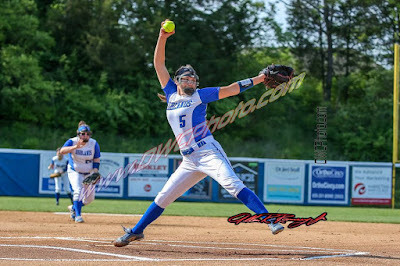 The Bluebirds scored three times in the first, but Notre Dame senior pitcher Lauren Durstock hit a three-rune home run in the bottom of the inning to tie it up. PHOTO: Allen Ramsey, DWCPhoto.com. Highlands senior Alyssa Dixon records an out in a recent game. It marked the second time this season these two teams faced off. 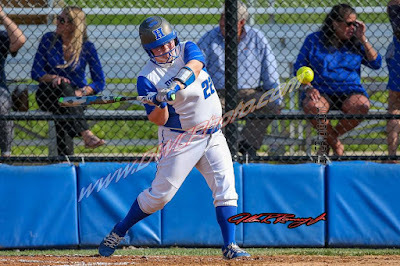 But the result did not change much as the Highlands Bluebirds softball team (14-10 overall) handled the host Conner Lady Cougars, 12-5 in Hebron on Monday. 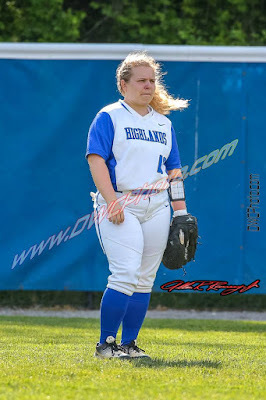 Highlands also beat Conner (2-14) by an 8-2 count in Fort Thomas on April 11. Highlands led 6-0 after two innings and cruised to the win. PHOTO: Allen Ramsey, DWCPhoto.com. Highlands senior Grant Summers takes off in a recent game. 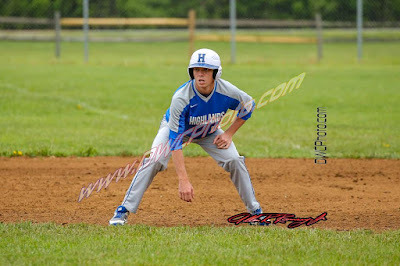 The Highlands Bluebirds baseball team made it to the championship game of the Coach Conner Classic on Saturday. But the Cooper Jaguars scored five times in the bottom of the first and held on for a 6-5 victory. The Bluebirds (20-11 overall) are 13-3 in 9th Region action. 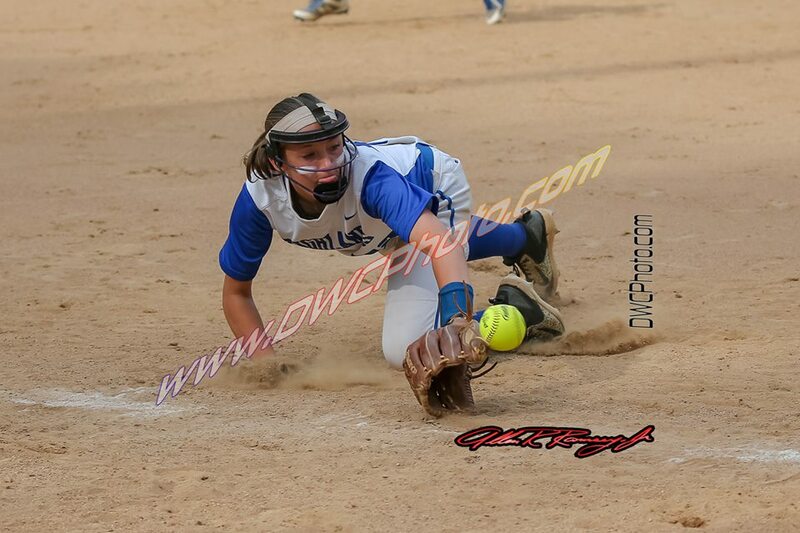 Highlands had the tying run on third with two out but could not push it across. PHOTO: Allen Ramsey, DWCPhoto.com. Highlands senior Ella Greiwe fires to the plate in a recent game. For the second straight game, the Highlands Bluebirds softball team started its nine seniors. Highlands (12-8 overall) may not have played as well. 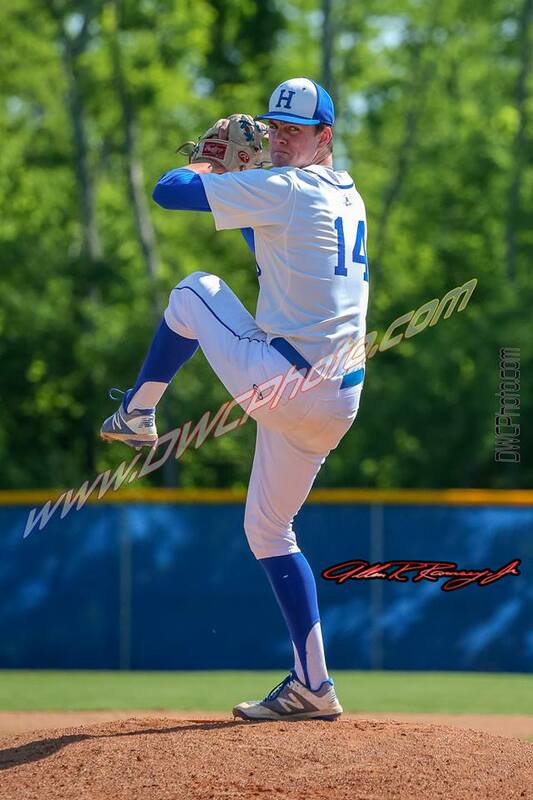 But the Bluebirds recorded another crucial 36th District win, 11-1 over Bellevue in five innings at Winkler Field. Highlands moved to 3-0 in district play. PHOTO: Allen Ramsey, DWCPhoto.com. Highlands senior Baylie Ormes waits during a break in the action against Newport on Thursday. 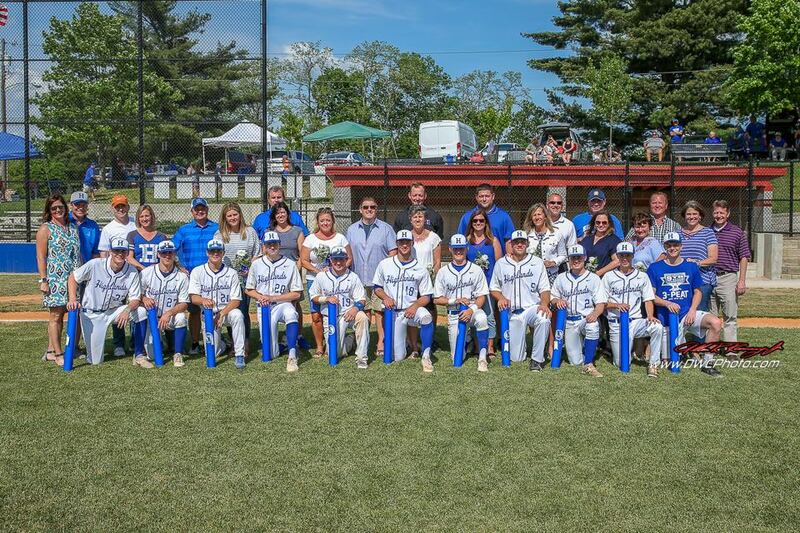 All nine Bluebird seniors started Senior Day in a 17-2 win over Newport. The coaching staff made sure the nine Highlands softball seniors had a memorable day Wednesday. 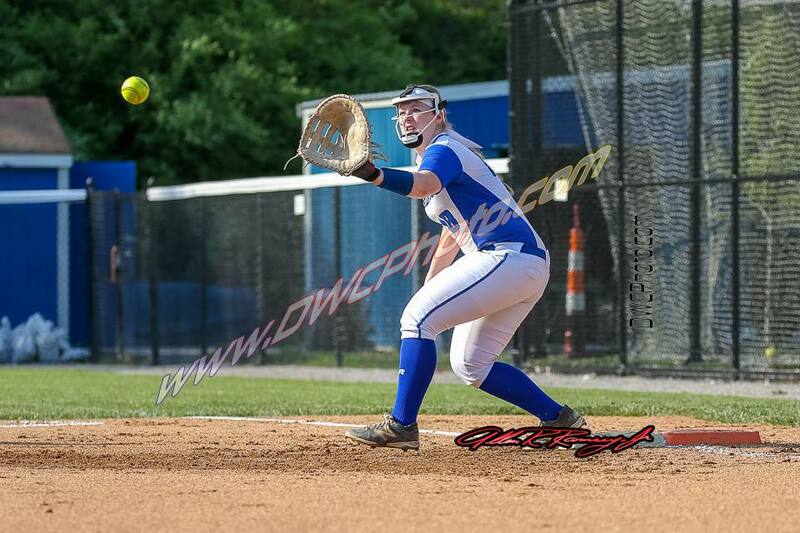 All nine started, played the entire game and had at least one hit in the 17-2 four-inning run-ruling of the Newport Ladycats in 36th District play. Highlands moved to 11-8 overall and 2-0 in district play with the victory. PHOTO: Allen Ramsey, DWCPhoto.com. Highlands junior Casey Greene leads off first in a recent game. The Highlands Bluebirds baseball team wanted to again solidify the top seed in the 36th District Tournament with another perfect run in seed play. The Bluebirds (17-10 overall) needed to beat the Dayton Greendevils (3-14) to do just that. Highlands took care of the visitors, 24-1 in five innings to do that Tuesday. Contributed Photo. Highlands senior Brooke Hodory attempts to hit the ball back in 10th Region singles action over the weekend. 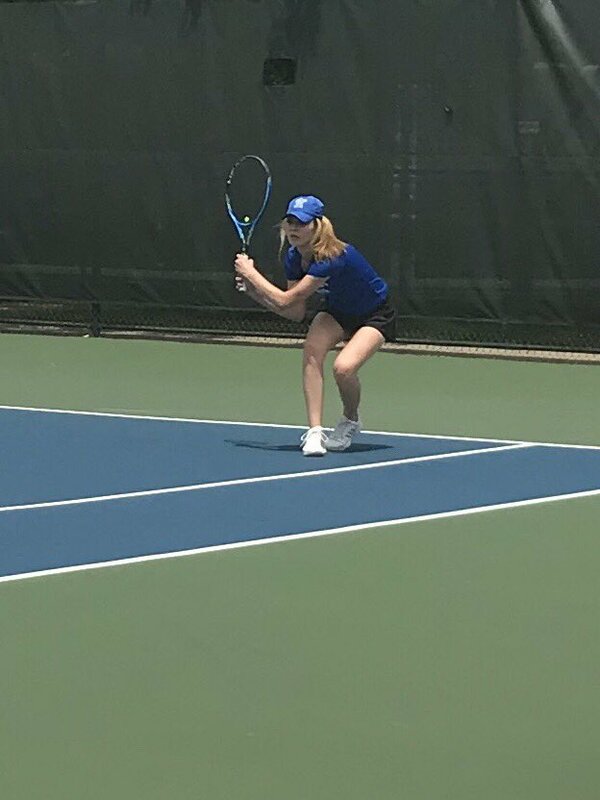 The Highlands Tennis teams both finished in the top three of the 10th Region runner-up at Easy Walker Park on Monday at Mount Sterling. PHOTO: Allen Ramsey, DWCPhoto.com. 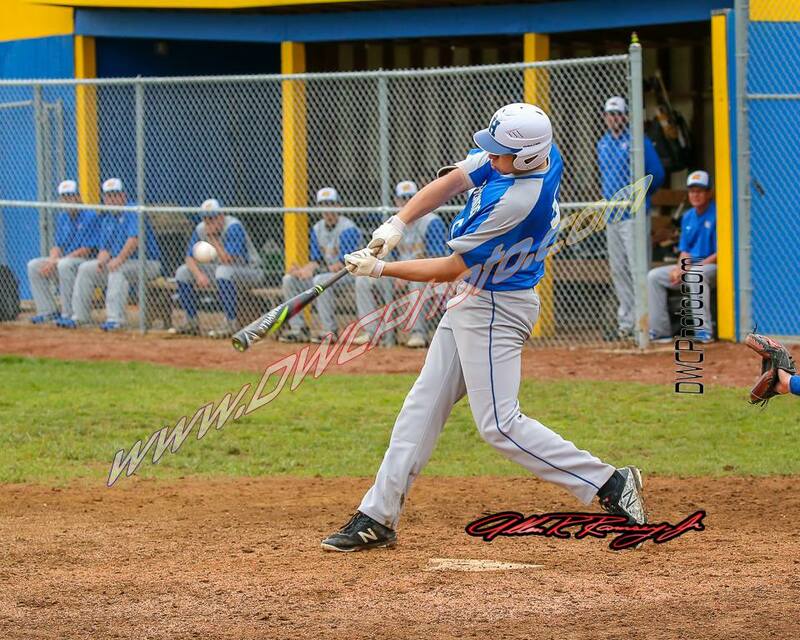 Highlands senior Tyler Gulley blasts a home run Saturday against Newport Central Catholic. The Bluebirds recorded a 19-0 win for their 10th straight against the Thoroughbreds. The rain stayed light enough to get this important 36th District baseball rivalry game in. 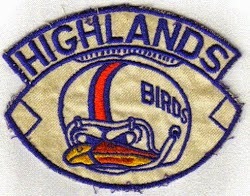 While the players and coaches may not talk about it heavily, the Highlands Bluebirds took down the Newport Central Catholic Thoroughbreds for the 10th straight time. This game quickly turned into the most lopsided of them all as the Bluebirds (16-8 overall) took care of the Thoroughbreds, 19-0 in five innings Saturday morning at Morscher Field. PHOTO: Allen Ramsey, DWCPhoto.com. Highlands junior Rachel Gabbard records an out in a recent game. The Highlands Bluebirds softball team (10-7 overall) dropped a tight 5-4 decision at Campbell County on Wednesday. PHOTO: Allen Ramsey, DWCPhoto.com. 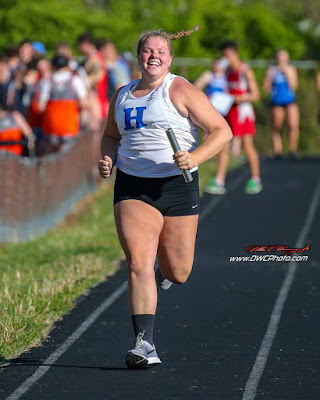 Highlands senior Mary Claire Redden strides forward in a relay event at the Red Dog Track and Field Meet at Tower Park on Tuesday. 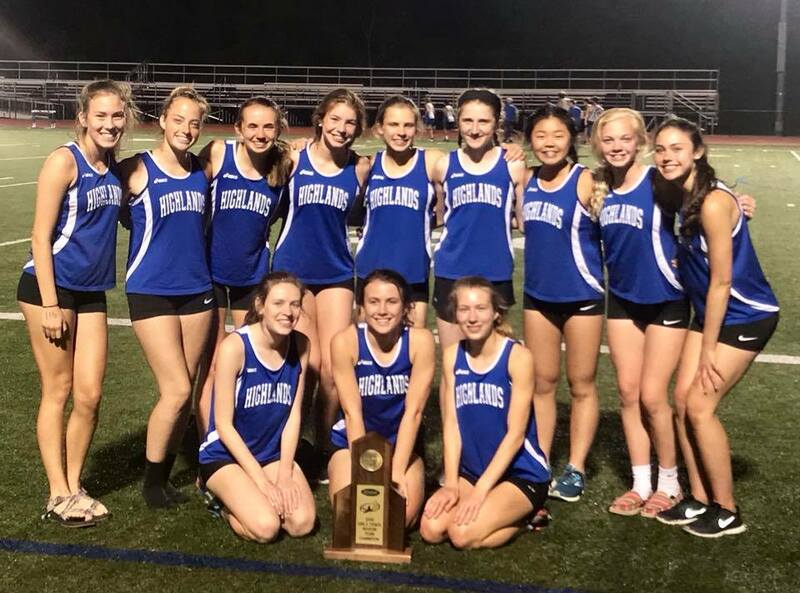 The Highlands girls won the six-team event. 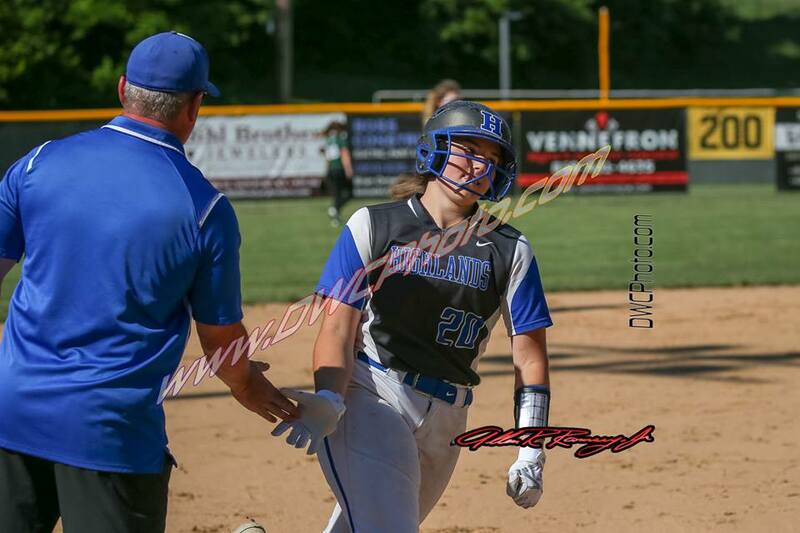 The Highlands Bluebirds softball team won its second game against an Ohio opponent Tuesday with a convincing 19-7 win over the host Cincinnati Turpin Spartans in six innings.